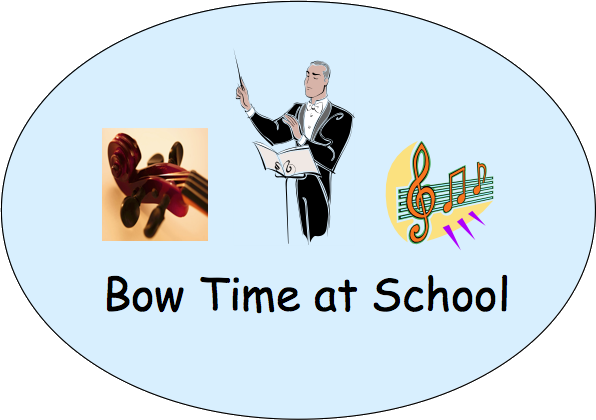 If Bow Time classes are offered at your school, there are several steps needed to get your child ready for class. Do not follow these steps if Bow Time is not currently offered at your school! 1. Complete an on-line registration form – click on “Registration”, complete the form for each child that you want to register, and submit. Completing the form is just for information gathering purposes and does not obligate you in any way. 2. Attend an information session at your school with your child if one is scheduled – select the Home tab and scroll down to Announcements section for schedule information. At this session, your child will have the opportunity to try out or listen to the violin, viola, and cello to help them decide which instrument to select. In addition, detailed information will be provided on how and where to get what your child needs for class, as described directly below. The first class will be held exactly 2 weeks after the information session, and it is extremely important that your child comes fully equipped. Additionally, logistics related to where to store their equipment on Bow Time day before class, when and where to pick up your child after class, etc. will also be covered. And any questions you have related to tuition payments and what to do when your child is tracked out will be answered. • A portable music stand with a carrying case. This will need to be brought to class each week because most schools have a very limited number of music stands. • An Essential Elements book 1 specific to the instrument that your child has selected. • A shoulder rest if your child has selected violin or viola. If your child already has an instrument, it is important to make sure that it is the correct size. Having a bow in good condition and rosin is also important. In most cases, your child will need to get an instrument. Unless your child is big enough to get a full sized instrument (not usually the case for Elementary School children), it is much better to get a rental instrument. As your child grows, the rental instrument can be swapped out for a larger size at no cost, and rental expenses can usually be applied to the purchase of an instrument later on. By far, the most convenient way the get what you need is to visit a Music and Arts store. If you attend an information session at your child's school, a representative from the music store will be present to assist. If you are unable to attend the information session, be sure to take your child with you so that they can get measured for the correct sized instrument. And, if you ask for a “Bow Time Bundle”, they will give you what you need at a 10% discount. Of course, you are free to get what you need at any store of your choosing. • 5950 Poyner Village Pkwy, Suite F101, Raleigh, NC 27616. They are located close to the Triangle Mall in North Raleigh. Their phone # is 919-872-1601. • 426 Crossroads Blvd, Cary, NC, 27518. They are located in the Cary Crossroads Plaza. Their phone # is 919-854-0024. • Information about beginner's classes will be provided at the Information Session or by email if you are unable to attend.